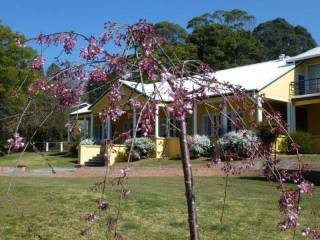 Just minutes away from the village of Bundanoon, Yallambee is a modern and stylish hosted B&B sleeping up to six people, is set in a very quiet location adjacent to the Morton National Park. The house sits centrally on an acre of terraced gardens and overlooks the treetops of the national Park. Many of the parks features- lookouts, stunning walks and the Glow Worm Glen are accessible from the doorstep. 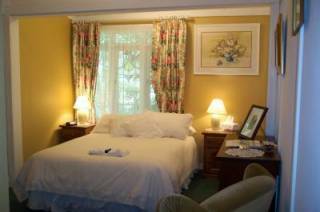 Two spacious guestrooms are situated on the upper floor of the eastern end of the house. The North Room has a queen size bed, large ensuite (with a luxurious bath suitable for two and a double shower) and single sofa bed, and the South Room has a king size bed (or twin), ensuite with shower and views through the silver birch to the National Park. Quality linen, bathrobes and ironing facilities are supplied for you in all guestrooms. Directly underneath is the guest lounge area - with polished wooden floors, slow combustion log fire, TV, DVD, Video, CD player, magazines, books and puzzles, and a very , very comfortable lounge and chaise, tempting you to stay and relax. Wireless Internet is available in the lounge area. The third guest room is located off the dining room and has a queen bed with an additional bed and a shower ensuite. 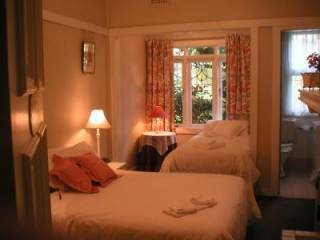 It is a more private room, suitable for a couple, twin share or small family. The dining room is in the western end of the house. It has large cedar windows, polished wooden floors and a slow combustion heater to warm you in winter. Here you can enjoy a leisurely breakfast over the days newspapers. Start with cereals, fresh and poached fruits, espresso coffee or leaf teas, followed by your choice of the mornings cooked selections, and perhaps toast with homemade jams and marmalades. Why not pamper yourself with our mobile beauty therapist - theraputic massage, facials, manicures, bodywraps - all brought to you. 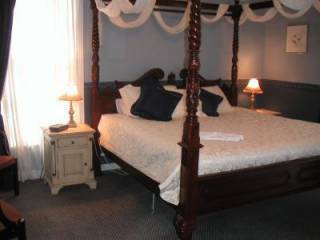 Bed & Breakfast and Dinner, Bed & Breakfast packages available. Smokers.. No smoking inside the house please. There is smokers facilities provided on the back verandah for guest use. Smoking in the bedrooms will attract an additional fee for laundering all linens in the room and necessary deodorising of the room. Noise.. Please be aware that other guests outside of your party may be staying at Yallambee and be considerate in regards to noise and your childrens behavior. Children.. well behaved children (like adults) are always welcome! There is a kids box of drawing things and games available and loads of space for them to play outside onteh back lawn or lower games lawn. Balls, boules, badminton and croquet sets available for guest use. No deposit is required but a credit card number and expiry is needed as surety to secure your dates. Phone these through for your security. If booking is cancelled within 7 days the first nights accommodation will be billed to this card for any rooms booked unless a replacement booking is received. If cancellation one day or less prior to your stay or a now-show is registered, the whole stay will be billed unless a replacement booking is received. From Sydney.. for the scenic route, take the Mittagong/Bowral exit and meander through all the towns and villages on the way - Mittagong, Bowral, Moss Vale, Sutton Forest. Take the Bundanoon turn off at Sutton Forest, proceed through Exeter and onto Bundanoon. The town map is best from this point as we are not on the main road but a few streets off it bordering the National Park. If you dont have time to meander and stop on the way, take the Illawarra highway or Sally's Corner Rd exit off the Hume highway, follow signage to Exeter and then onto Bundanoon. From Canberra.. for the scenic route, take the Highlands Way route just after Maroulan and meander thru the villages of Talong, Wingello, Penrose and onto Bundanoon. A lovely daytime route taking in a changing countryside from the Tablelands to the Highlands. If time is restricted, take the Sally's Corner rd Exit (Shell, McDonalds interchange) into Exeter on then onto Bundanoon. Note: if travelling at night be careful of wildlife - kangaroos, wombats and possums are out and about especially in the rural area and thise bordering the National parks. Train.. there is a limited rural train service available with some bus connections required if using the city rail network. We can pick up from the station or town by prior arrangement. Check CountryLink or Cityrail timetables for services.